Where to Play Caribbean Treasure for Real Money? That’s right, this is another slot based around the world of piracy, however this one Is based more on the Caribbean setting, and less on the swashbucklers themselves. This means that you’ll find various tropical symbols spinning around on the reels – including a pirate ship, a crab and a beautiful lady – as well as hordes of buried treasure, just like the name of this slot implies you’ll find. Standard slot symbols, such as Sevens and BARs are also on the reels though, bringing a sense of familiarity, but also a sense that iSoftBet could have done a little more work making the reels look great. Although pirate themes have been done before – perhaps too many times – this one only touches on piracy, therefore can’t be seen as a true pirate slot. This can only be a good thing, as slot players want variety, and this means that they don’t need to see any more Pirates of the Caribbean rip-offs or parodies! How to Play Caribbean Treasure Casino Game? So, how do you go about playing Caribbean Treasure? Well, it is incredibly easy, as it has just five paylines, plus the general layout of the page is simple and uncomplicated. First you’ll need to choose how many of the five paylines you want to play, and then you’ll need to choose how much to bet per payline. If you’re short on cash, it is generally best to choose more paylines at lower stakes, rather than vice versa. This is because more paylines leads to more chances of winning, allowing you to (hopefully) build up your bankroll gradually. Once you’ve decided on the number of paylines and the bet amount, it’s simply a case of spinning the reels and seeing how much you can win. You might also see one of the bonuses spin into view, which could be great news for your account balance! What’s more, you could also win access to one of the three progressive jackpots, which are won when three or more jackpot symbols line up on the paylines. It is important to remember this though: the progressive jackpots can only be won when playing at the highest possible stake, meaning that you have to be betting all five paylines at two coins each. 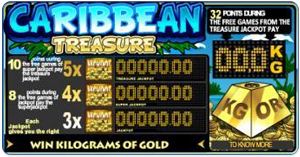 If you want to play a slot with loads and loads of bonuses, Caribbean Treasure isn’t the online slot for you. If you’d rather play a slot with a couple of highly innovative bonus features though, you’ve come to the right place. The first thing to watch out for are the multiplier wilds, which appear on the reels during the base game. These are wild symbols, so they can replace other symbols on the reels, and they are also multipliers, meaning that they’ll multiply any win they are part of. The largest multiplier on the reels is worth 8x your prize, however it is far more common to see the 2x multiplier spin into view. It should be mentioned that these only work when forming a five symbol combination though. The progressive jackpot at this game is a bit different to the norm, as it isn’t just won by lining up the jackpot symbols – there is also a further step to complete. Firstly, the number of jackpot symbols you get will determine which of the three progressive jackpots you get to play for, with the highest clearly coming when spinning in five of the symbol. After you’ve spun them in, you’ll be granted a number of free spins, and every time you spin in a further jackpot symbol, you’ll get a point. If you manage to get enough points, you’ll then be rewarded with the progressive jackpot. It’s an interesting way of winning the game’s top prize, however it is pretty fun and is something a little bit different. Other than that, there are no other bonuses at Caribbean Treasure. This means that it isn’t too heavy on bonuses, and that nearly all of the action will played out at the base game. Whether this style of slot suits you really is down to personal preference, so why not play it today and see if you like it?